Where Do I Find Windows Phone 7 Apps? A new Windows Phone 7 device gives you the chance to download apps and music to your handset so that you can enjoy them at any time and any place. 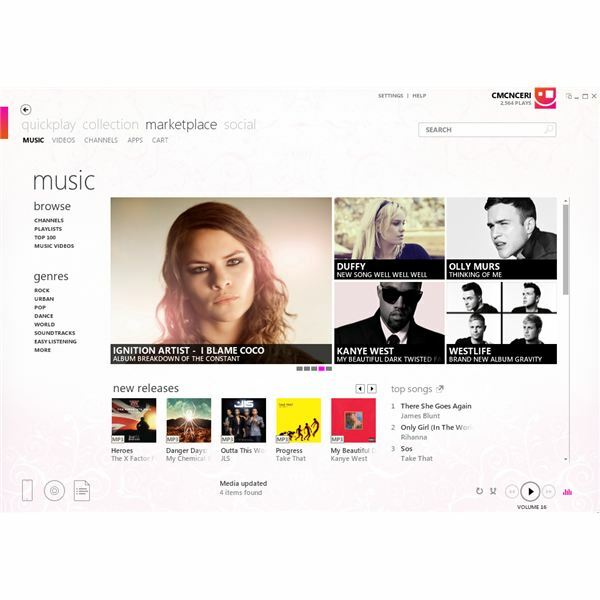 Apps can all be downloaded from the Marketplace as a trial version before a fee has to be paid, and occasionally free tracks are available from the Zune store. As the Marketplace is online, these services require your mobile network’s mobile internet provision, or a wireless network. However, not everyone has mobile internet or a Wi-Fi router in their home, so how might an app or album be downloaded then? Thanks to the Zune desktop client (available from www.zune.net) you can hook up your phone to your PC and browse for apps on your desktop. In this situation, the Zune client stops being simply a music player and becomes a gateway to a huge online store supplying music to your PC and phone as well as mobile Windows Phone apps. In order to access the Zune store and view and download apps to your phone, install the Zune software and then connect your Windows Phone to your PC via the included USB cable. Zune should now open automatically and identify your Windows Phone 7 device. Note that with all subsequent purchases, you don’t need your phone connected; once recognised as a Windows Phone 7 owner, you can download apps, music, games and video and they won’t be downloaded to your phone until the next time you connect. 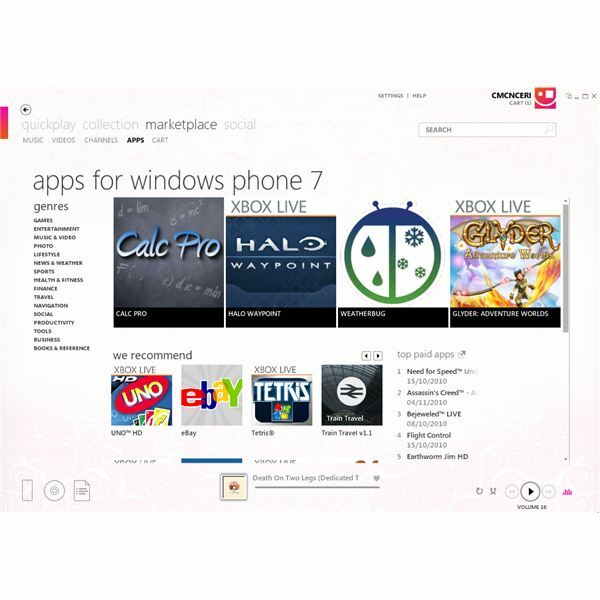 To view the available apps, go to the Marketplace tab in Zune. Here you can choose between Music, Videos, Channels and Apps. By opening the Apps screen you can then start browsing the Marketplace for any app you like! There are different ways of accessing the app library; you can begin by looking at the recommended apps on the front page, or accessing one of the categories listed on the left hand side, such as Games, Entertainment, Music & Video, Tools, etc. Finally, you can use the Search function in the top right corner of the page – this will display not only apps but also music, with the screen split into different sections for different types of content. With your chosen app selected, click the app to open its details. Here you will find screenshots as well as a description of the app. An average rating is also displayed, while clicking View Reviews will display the thoughts of other people that have tried the app. These are worth reading to check if there are any problems or device-specific issues (something that might happen with any Windows Phone app in its early days of release). To download the app to your Windows Phone, click the Free Trial button. Zune will work out how much the app costs (nothing for a trial, of course) and then display this and ask you to Confirm the download. You can Cancel at this stage if you wish. In order to purchase an app, rather than click Free Trial you would use the Buy option, where the price is displayed. With the price displayed you would then click Buy once again to add your credit card details. Once authorised, the app will be downloaded! A similar process is in place for the downloading of entertainment content from Zune. When you open Zune, go to Marketplace > Music. Here you can use the Browse or Genres lists on the left hand side, use the Search function in the top right or have a look through the recommended tracks on the main view. To purchase, find the track or album that you want, and then use the Add to card button. If you have a Zune pass (£8.99 in the UK, $14.99 in the US; these are monthly options with discounts available for the 12 month option) then your purchase will be approved. You can download an unlimited number of tracks per month and keep up to 10 of them. If you don’t have a Zune Pass you will be prompted to sign-up for one and enter your credit card details to proceed. Once this has been done, your media will be ready to download!